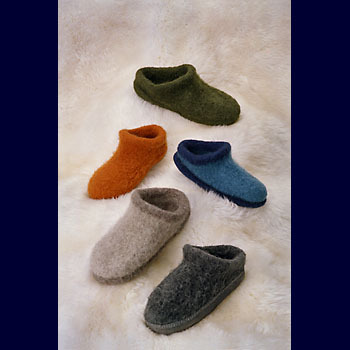 Description: Felt Ballerina Slippers designed by Bev Galeskas. Size: Childs Sm, Med, and Lg, and Women's Sm, Med, and Lg. Finished size approximately (6 inches, 6.75 inches, 7.5 inches, 8.25 inches, 9 inches, and 10 inches). The exact finished size is determined by your yarn choice and the amount of felting. Yarn Requirements: Worsted weight, (145, 165, 185/ 250, 275, 300) yards. Other Supplies Circular needles, size 10.5. Gauge 14sts per 4 inches.